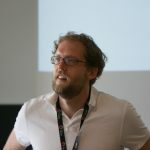 is co-founder of OpenCage Data, makers of the OpenCage Geocoding API  – a single API aggregating multiple open geodata sources. Prior to that he was co-founder of Nestoria, a real estate search engine that in 2015 was acquired by Mitula Group. In 2006 Nestoria was the first company to use OpenStreetMap commercially. Since 2010 he has organized #geomob , a bi-monthly London event that showcases geoinnovation, whether for fun or profit. He is a seed investor in geo start-ups like What3Words , Localistico , AVUXI  and SplashMaps , amongst others. He is a regular contributor to GeoHipster . Ed has an MBA from MIT, a bachelors degree in civil engineering, and was a Fulbright Scholar in Weimar. He lives in Barcelona with his wife and two children, where, for fun, he adds the area in and around Tres Torres and Sarria to OpenStreetMap .